Light is such an integral part of my work. It is so powerful in influencing what we see and feel; how we perceive colours and shapes and even our emotions. All of it is exciting, from the bold and brash to the soft and subdued. I am currently working on two series. 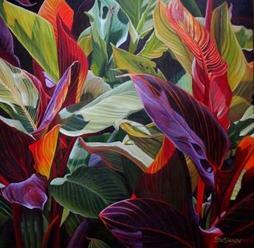 The first is a series of tropical leaf paintings with six pieces complete and more on the drawing board. In the summer months I grow Canna lilies in pots so that I am able to move them around freely to catch the light through their leaves. The light is everything. It has the ability to change the colours of the Tropicana lilies from dark and nondescript to something vibrant and glowing. The leaves turn from deep burgundy to vibrant reds, oranges and corals, all with exquisite veining and they contrast against the greens of the other Canna leaves. This series will eventually include banana and castor bean plants. The second series is driftwood pieces. There are currently four pieces completed and a number more in the planning stage. Each piece of driftwood has a distinct personality. The colours and textures intrigue me; the way the sun and salt have bleached the wood and the surf has pounded it smooth, revealing the whirls and twirls of the grain and the golden, fuzzy areas that have been shredded by the sea. In almost every piece of driftwood there are stones; some large and some tiny, that have been forced into the crevices by the power of the ocean. When I am able to find a piece of driftwood that is bathed in sunlight as in "Let There Be Light" or "Illumination" it is such a bonus!